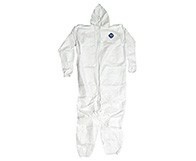 DuPont™ Tyvek® coveralls are made of flash-spun, high-density polyethylene which creates a unique, non-woven material. The protection is built into the fabric itself; it can’t be abraded or worn away. Commonly used for protection against airborne debris in extremely dusty environments. Lightweight and breathable, comfortable to wear. Highly resistant to ultra fine dusts, an excellent choice for metal finishing as it won't allow the polishing fines to penetrate the fabric. Economical replacement for cotton garments, product is reusable and disposable. Excellent protection in hazardous and non-hazardous dry-dust environments.